No one likes the idea of wildlife being trapped between a rock and a hard place, but new research is showing that this may be the situation faced by bumblebees in warming temperatures. A study published recently in the journal Science  has drawn attention to the negative impacts of climate change on bumblebees in both North America and Europe. The lead author, Dr. Jeremy Kerr from the University of Ottawa, is also a member of the ABMI’s International Science Advisory Team. A recent article in the journal Science has highlighted the impacts of recent climate change on bumblebees, like this Bombus borealis, in North America and Europe (Photo: Monica Kohler). In this study, researchers used bumblebee data from 1901-2010 to demonstrate that the southern edges of bumblebee ranges have crept northward by as much as 300 km in response to climate change over the last 40 years, but without a corresponding increase in their northern ranges. In other words, the distributions of bumblebees are being squeezed by climate change. The results are raising alarm bells that climate change is another factor—on top of pressures such as pesticide use and parasite infection—having a negative impact on bee populations. 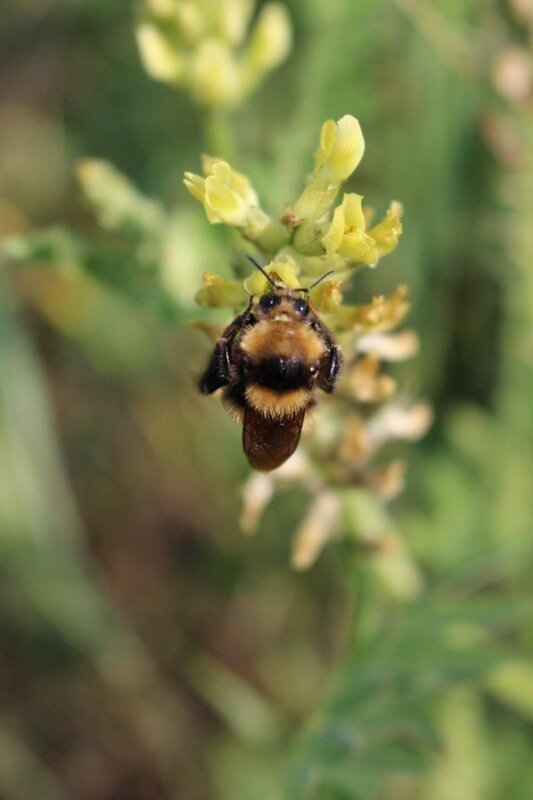 In Alberta, two bumblebee species are considered at risk: Bombus occidentalis occidentalis (subspecies) is designated as “Threatened” and Bombus terricola is a species of “Special Concern”, according to COSEWIC (the Committee on the Status of Endangered Wildlife in Canada). In both cases, population declines of approximately 30% have been observed across their southern ranges. While climate change is potentially playing a role, these species—in particular B. occidentalis—are also being affected by a myriad of other pressures, most notably high parasite loads . To tease apart the impacts of climate change and other factors (like pesticide exposure and parasite loads, in the case of bees) on wildlife populations and distributions, it’s essential to collect long-term data of species occurrences over a broad geographic area  (such as the type of data the ABMI collects for hundreds of species, including most birds and flowering plants). Unfortunately, for many parts of Canada, including Alberta, information on bees is generally lacking. Although we know Alberta boasts a wide diversity of bee species, the genus we understand best—Bombus (aka the bumblebee)—represents only one of approximately 30 bee genera living in Alberta. Alberta is home to a wide diversity of bee species, like this small-bodied species from the genus Megachile, but we still have a lot to learn about them (Photo: Monica Kohler). Part of this information deficit is being addressed by a project launched in 2014 by researchers at the University of Alberta in collaboration with the ABMI’s Ecosystem Services Assessment project. 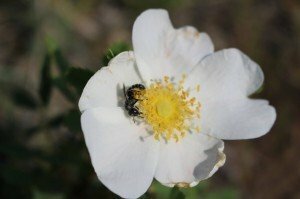 The goal of the project—funded by the Alberta Livestock and Meat Agency (ALMA)—is to assess the pollination services provided by native bees to flowering crops and native plants, and to provide new and valuable information on the diversity of bee species and their ranges across the province. 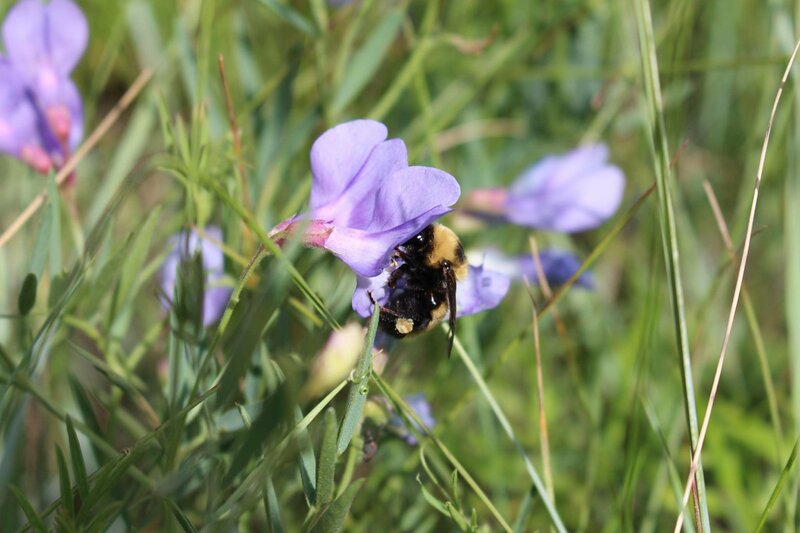 Bee surveys are conducted in canola fields and native rangelands across Alberta’s agricultural zone, and to date over 85 different species of bees have been identified, including 21 bumblebee species. And, there’s still a significant amount of data to be gleaned from the collected samples; the bumblebee specimens constituted less than 15% of the individual bees caught across the province. By collecting comprehensive data of bee occurrences, not just bumblebees, across Alberta’s agricultural region, this study (still ongoing, with another field season currently in full swing!) is defining the current distributions of these species and generating data that can ultimately help scientists identify the factors that are most affecting the diversity of bee species and their populations in our province. Feature Photo: An unidentified Alberta bumblebee (Bombus sp.). Photo by Monica Kohler. Read more about the recent Science article here. More information on the conservation status of B. occidentalis and B. terricola is available from COSEWIC. For more information on how monitoring data can be used to detect the impacts of climate change on species and ecosystems, check out the recent report “Adapting monitoring to more effectively assess the impacts of climate change on Alberta’s biodiversity” prepared by Erin Bayne and colleagues for the ABMI’s Biodiversity Management and Climate Change Adaptation project.